Historically, coastal prairie communities occupied an extensive range from northern California to British Columbia. Today, these communities have been severely fragmented as a result of development, agriculture, recreational use, and invasion from non-native species. With the degradation of these habitats, many plant and animal species have experienced a quick decline, most notably the Oregon silverspot butterfly (Speyeria zerene hippolyta) and its larval and adult food sources, including hookedspur or sand violet (Viola adunca), coast goldenrod (Solidago spathulata), Douglas' aster (Symphyotrichum subspicatum), and edible thistle (Cirsium edule). The silverspot butterfly is listed federally as threatened and in Oregon as endangered, emphasizing the need for protection of remaining habitat as well as restoration and enhancement of potential new sites that encourage expansion of the species. The Institute for Applied Ecology (IAE), the North Coast Land Conservancy, and the Willapa National Wildlife Refuge have teamed up to develop an adaptive management strategy that targets the restoration of 140-acres of coastal prairie by 2020 to create suitable habitat for the reintroduction of the Oregon silverspot butterfly. This effort is funded by the U.S. Fish and Wildlife Service. Oregon silverspot butterfly on a coast goldenrod (left) and the larval host plant, sand violet (right). Butterfly image courtesy of the Oregon Zoo and violet image courtesy of Prairie Moon Nursery. This targeted restoration effort will help to meet short-term and long-term conservation needs for the butterfly and the associated habitat. Previous studies have tested various management techniques, including prescribed fire, mowing, herbicide application, solarization, grazing, topsoil removal, topsoil inversion, and soil impoverishment, with the desire to mimic non-climatic natural disturbance processes and improve habitat viability (Van Dyke et al. 2004). This May, the Conservation Research team established a restoration experiment on four different sites to test three site preparation options including topsoil removal, topsoil inversion, and herbicide application. All four sites are located on protected land in a maintenance stage of restoration; three of the sites are located on land owned by the North Coast Land Conservancy in the Clatsop Plains north of Seaside, Oregon and the fourth site is located on the Long Beach Peninsula in Washington on land owned by the Willapa National Wildlife Refuge. The initial site preparation techniques will be followed by seeding and planting of native species. Over the next three years, a combination of management techniques will be implemented to determine the most effective strategy for restoration and maintenance of coastal prairie habitat. These techniques may include seasonal herbicide application, hand-removal of invasive species, and high-intensity grazing, and will be adjusted based on the effectiveness of meeting management objectives. 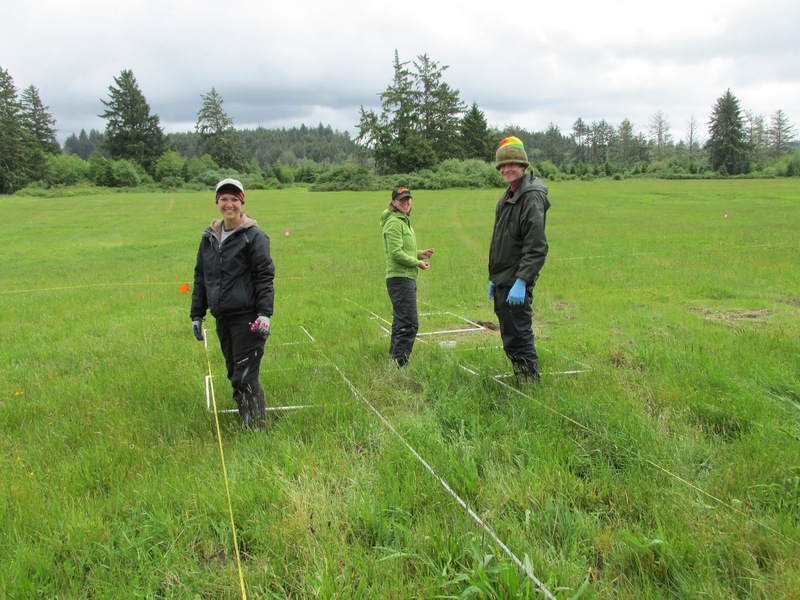 Naturalist Denise Giles-Johnson (center) establishing experimental plots. After initial set-up of the experimental plots, we conducted pre-treatment monitoring of the plant communities, including percent cover of each species present and ground cover classifications. Continued monitoring of the plant communities on an annual basis will help us determine whether the management techniques are leading to desired conditions of high native forb cover (especially of the obligate species on which the Oregon silverspot butterfly depends) and reduced invasive species cover. In turn, the plant community composition will also support the determination of the most appropriate habitats suitable for reintroduction of the Oregon silverspot butterfly. Stay tuned in future years to hear the results of this new experimental project! 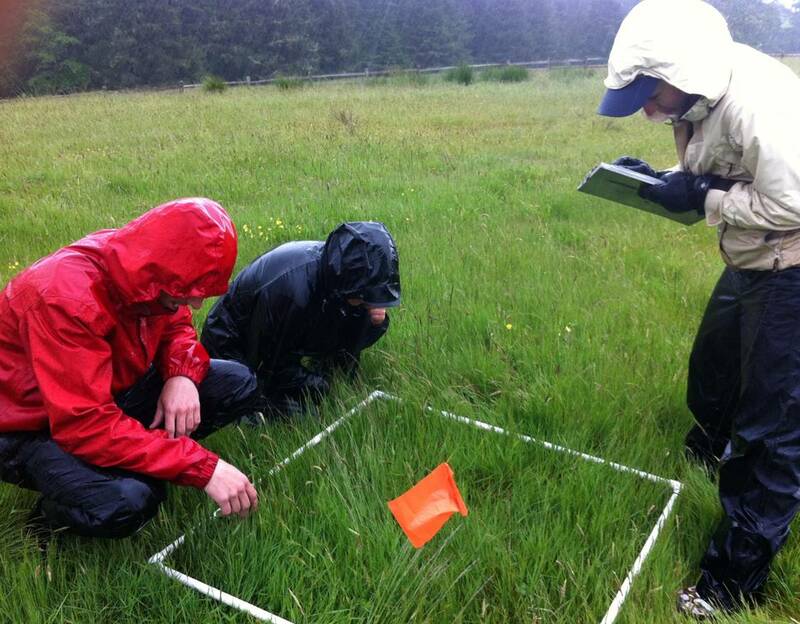 Charlotte Trowbridge (right) monitor species cover in the rain at a Clatsop Plains site.